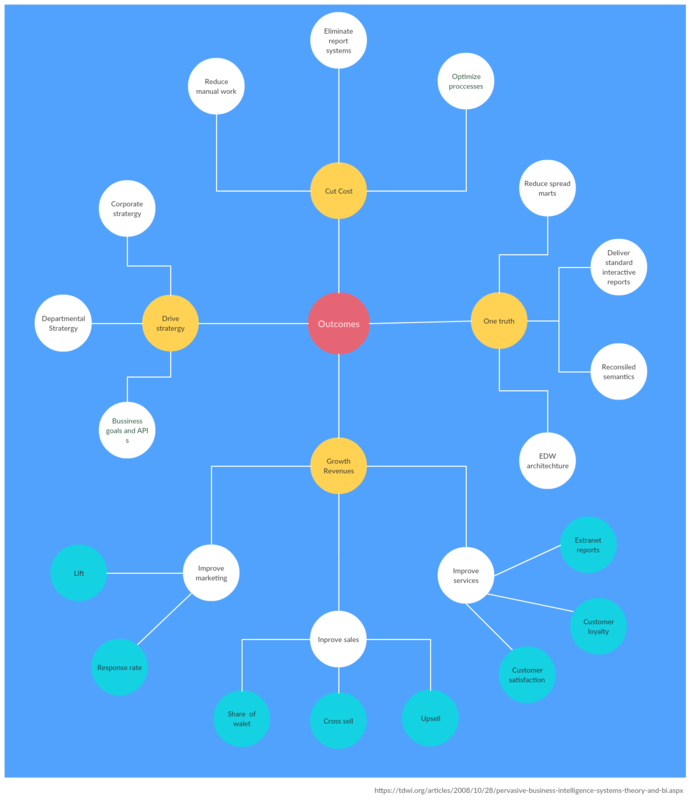 This concept map tutorial is to help you master the technique of using concept maps, whether it is for your education or for your business. Concept maps are a graphical tool that is used to visualize meaningful relationships among concepts. It’s used as a knowledge representation tool, meaning they basically represent the knowledge structure that we humans store in our minds about a certain topic. Both simple and complex concept maps consist of two things: concepts and relationships among them. 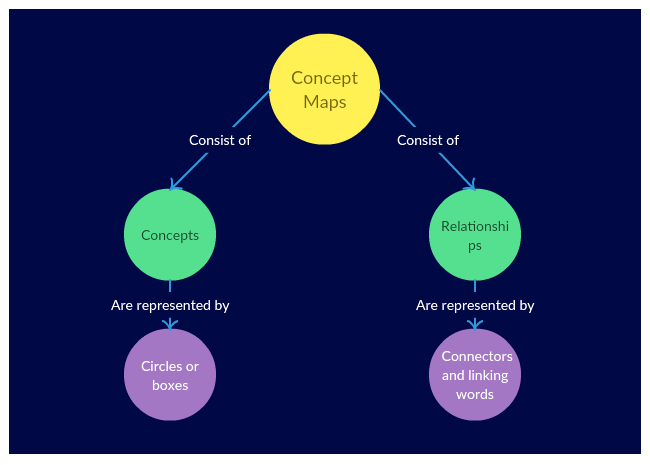 Concept maps were the outcome of a research done in the 1970s at Cornell University by Joseph Novak – an American Educator and Research Scientist – and his research team. In order to study how children understand basic science concepts, they studied and interviewed many children. However, they found it difficult to identify the changes in the ways children understood science concepts with the detailed interview transcripts alone. The need to find a better solution to represent children’s conceptual understanding led to the development of the concept map in 1972. Since then it has been used extensively not only in the fields of education and research but also in business. Nodes are the circles or the boxes that are used to represent a concept or an idea. These may vary in size, according to their hierarchy on the map; for example, more general nodes at the top of the map may be bigger than the more specific nodes that follow them. Concept maps consist of concepts in different domains. And the relationships between these different domains of knowledge are shown with cross-links. Or linking phrases if it contains more than a word. These describe the type of relationship between the two concepts and appear on the line connecting them. Usually, concept maps are organized hierarchically. This means the most general and inclusive concepts are placed at the top of the map. Those that are more specific are positioned below them. 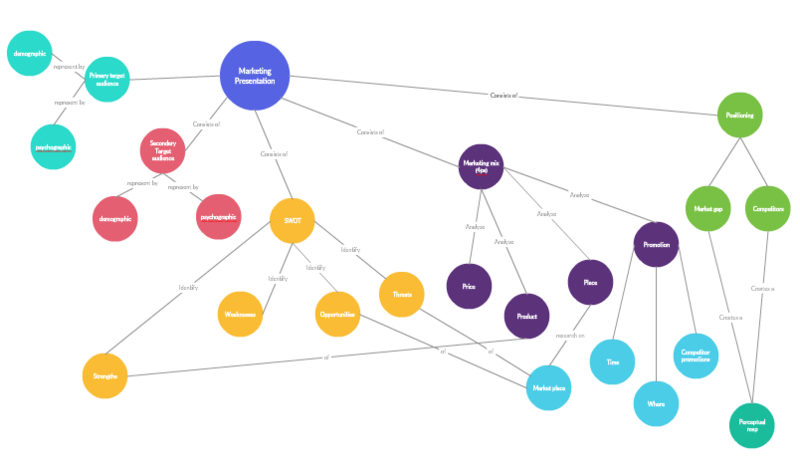 Accordingly, hierarchical concept maps are read from top to bottom. However, the structure of a concept map is not limited to this structure, it could take a free-form approach too – starting from the center and spreading outwards. 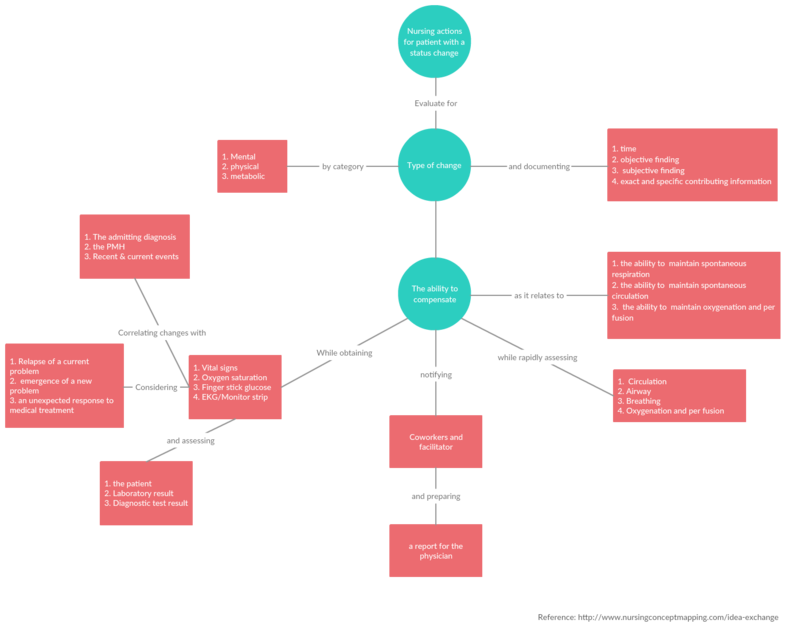 A concept map illustrates a set of meaningful propositions about a topic. Every two concepts (in some cases more than two,) along with the linking phrases, form a meaningful sentence, otherwise known as a proposition. For example, in the following concept map, the concepts “Relationships” and “Connectors and linking words” are connected by the linking phrase “Are represented by”. When connected, this forms the proposition “Relationships are represented by connectors and linking words”. Generally, a concept map should be woven around a focus question, which is the problem or the issue the concept map seeks to resolve. The better the focus question, the richer the concept map will be. Concept maps are based on Ausubel’s Assimilation theory. This is built around the fact that new knowledge can be learned effectively by linking it to what is already known. Concept maps are seen as a methodological tool of this theory. You can either draw a concept map on a piece of paper or on a concept mapping software. Either way, stick to the following steps when you are drawing one. The first step is to identify a topic you need to study with your concept map. This could be an idea, a question or an issue. For example, let’s say you are interested in SEO or Search Engine Optimization. What are the facts, ideas, concepts, themes, queries etc. that come to your mind when you think about this topic? Note these down as you brainstorm around the topic you have selected. Remember to keep these as concise as possible. It’s recommended to start a concept map from the top and develop it downward, although you can put down your topic at the center and expand it outwards. Either way make sure that the central topic stands out from the rest (use a bigger node, a different color etc.). Now it’s time to connect what you have brainstormed to the central topic and to each other. Remember, the more important the idea, the closer it should be to the top or the center. As you identify these connections put down the linking words or phrases to indicate the relationship between the two concepts you are linking. Once the direct connections between concepts have been identified, look for crosslinks that link together concepts from different areas or domains. Scrutinize what you have created to make sure that you haven’t missed anything and that the relationships you have identified make sense. Here are some concept map diagram templates you can edit right away on Creately. Click the image to open it in the editor. Make changes according to your needs and export them as images, PNG, PDF, or JPEG. Although first introduced to the field of education, concept maps have gained popularity across a number of other fields over the last few decades. In the field of education, concept maps are used as both a learning tool and an evaluation tool to assess student learning. 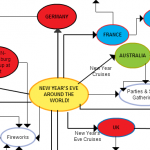 By design, concept maps are apt for business analysis. In the field of business, concept maps are popularly used to preserve, generate and share knowledge. To facilitate team brainstorming sessions to come up with new strategies, new business concepts etc. Help with planning and drafting business documents, business presentations etc. Concept maps in qualitative research are used as a methodical research strategy. Concept maps organized according to the hierarchical structure are easier to read. As the most general concepts go at the top and the more specific ones coming below them, it can easily be read from top to bottom. A concept map can have two root concepts, but limiting it to one helps the learner easily identify how concepts are constructed. On the other hand, having two root concepts may make it confusing. Colors help distinguish concepts in different domains immediately. This does not only make it easier to read the map but when it comes to recalling information, color coding plays a vital role. Two concepts and a linking phrase should make a meaningful sentence. This could be a word, phrase or sometimes even a symbol such as + or %. In any case, make sure that your concept map reads well. Having one single question to answer will help you better structure your concept map and keep yourself from deviating from your focus. If you are drawing your concept maps with a concept mapping software, you have the ability to make it more resourceful. When mentioning concepts, you can add active links to your concept maps allowing the reader to study the idea more thoroughly. 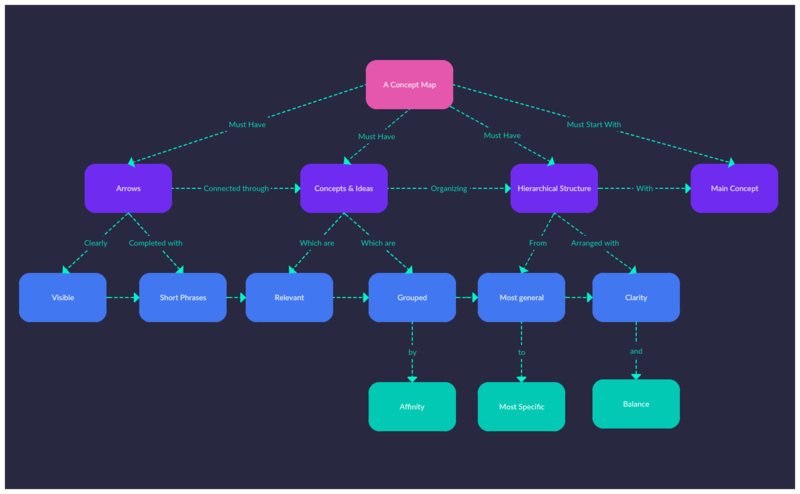 In this concept map tutorial we have covered, everything – whether you are a stranger to concept mapping or have used it before – you should know when it comes to concept map diagrams. 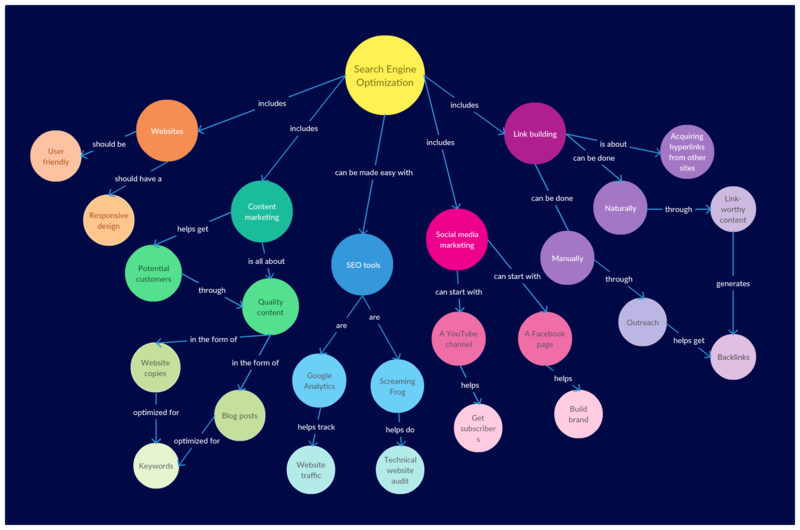 If you are ready to go ahead and draw your concept map, start with the Creately Concept Map Maker. And don’t forget to leave your feedback!